SAN DIEGO: Sony launched a social networking community as part of a larger strategy to build a stronger interactive Web presence. The company launched a beta version of the social networking site at http://electronicsblog.sel.sony.com/ on January 6, in conjunction with the kick-off of the Consumer Electronics Show (CES). Marcy Cohen, senior manager for corporate communications at Sony, said the social networking community is Sony's second foray into the social networking space, after it launched a corporate blog last year. 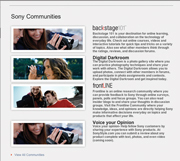 The corporate blog will serve as a cornerstone for the new social networking community, which will also include videos, photos, downloads, and links to other Sony communities. The company also plans to unveil more product- and service-focused sites over the next several months. Among them is a customer-service platform to help users resolve their customer-service issues with interactive features like forums. “This platform is really a base for developing other community and neighborhood sites,” she added. The platform will target Sony and technology enthusiasts, especially those who currently discuss the brand on third-party social networking sites. Sony promoted the new site as part of its CES press events, targeting bloggers, consumer electronics press, tech media, trade reporters, and the business press. Additionally, it is soliciting ideas from its fan base on what to name the site. Sony also has a Sony Electronics channel on YouTube, Twitter account, and Flickr page, as well as a Sony CES Facebook page.